My name is Paula Furneaux and I am a qualified Reflexologist. I am located in Maldon and based within easy reach of Heybridge. 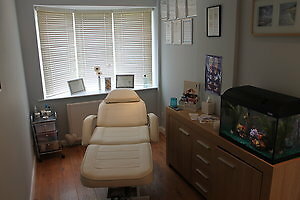 I have a dedicated treatment room at my home address in Maldon, although I can be mobile on request. Please take a few minutes to look at my website and if you have any questions please do get in touch. Reflexology Lymph Drainage is a ground breaking and multi award winning technique, which can be used to help reduce lymphoedema after treatment for breast cancer. RLD is also useful for clients with other (non-cancer related) more common conditions e.g. auto immune disorders. In terms of my continued professional development I would like to train in facial reflexology over the next 12 months. I am fully insured to perform treatments in Reflexology, Reflexology Pregnancy, Fertility Reflexology,Reflexology Lymphatic Drainage and Hopi Ear Candling. I am happy to provide my qualification certificates and insurance documents as evidence. Have a look at my treatment room below.